This has been a rough week for Russia. The country is subject to a witch-hunt in Germany, Latvia is provoking the EU to fight with Russia, and while the EU might be decaying and falling apart, it is still capable of striking terrible blows on Russia, a country that has never done any harm to anyone. In addition to those false claims, even the ambassador of the EU to Russia is just waiting for Russia to fall apart while Ukrainian President Poroshenko is scheming new provocations around Crimea to stay in power. A witch-hunt conjures the image of unjust accusations towards innocent people. Raging crowds chasing the innocent with pitch forks and torches; all ready to light the pyre under the captured witch. In a clear attempt to discredit the EU, the online outlet News Front published an article claiming that the EU’s ambassador to Russia “wants to see Russia fall apart”. This disinformation became possible after News Front misattributed a quote from another source appearing in an EU Observer article to the ambassador. The story spread to a number of other online outlets. But, as the saying goes, “it’s not true, but a good story”. Russian media are using all means available to create an image of a hostile, chaotic world around a peaceful Russia, permanently under threat by destructive forces which are only waiting to attack. 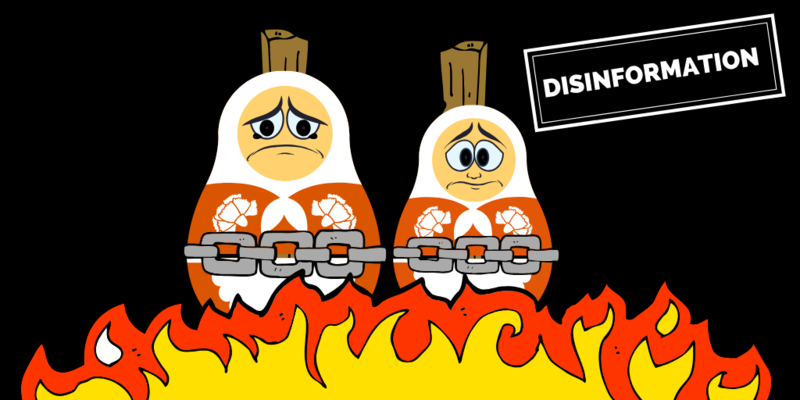 Anything Russian is subject to discrimination, defamation and discredit. The so-called witch-hunt is a reaction from German journalists on the working methods of some Russian media. Russia demands the right to ignore professional standards for journalism. All EU countries adhere to the concept of free media. Questioning, challenging, criticising authority are all fundamental rights of both media and citizens. Lying, deceiving or distorting facts are not. Claiming without a hint of evidence that the UK is deliberately destroying evidence in the Skripal case is not quality journalism: it’s demagoguery of the cheapest kind. Russian media must be judged by the same standards as any other media. The German Union of Journalists or the British Communications Regulator Ofcom are criticising Russian media outlets not for being Russian, but for providing a service that can hardly be called journalism. Instead of listening to criticism, Russian media boast, extraordinarily, that they are freer than European. The Bellingcat reports of a third suspect in the Skripal case did not make big waves on the disinformation front on Twitter. Russian outlets reiterated known narratives of media bias, Russophobia and distraction as a response to the latest findings, and continued to insist that Russia was not involved at all. The communication on Twitter continued to focus largely on high profile topics with a wide reach and potential impact like Venezuela and the Yellow Vests movement. The world outside Russia is generally a very unpleasant place, at least through the lens of Kremlin media: Ukraine is not only the world’s most dangerous place, but also a threat to the entire world. The possibilities of journalism without facts and evidence are endless! And if someone dares to criticise it – call it a witch-hunt! And the good news? The witches are safe and sound, alive and kicking. No witch-hunt today. And who dares to quarrel with Russia Today? As the outlet reports, the country’s coven of witches has actually offered their support to the Kremlin. Additional details: The United States are working against strong European Union. That is why Americans created the Ukrainian problem in Europe - in order to complicate dialogue between Germany and Russia. Disinforming outlet(s): Vremya Pokazhet @ Pervyi Kanal (19:19 - 19:35; 32:20 - 32:38). Conspiracy theory that combines two recurring pro-Kremlin disinformation narratives: regarding US presence in Europe and war in Ukraine. EU and US have long-standing relations that span over 60 years. Read more here. US did not create a "Ukrainian problem" in Europe. Additional details: Russia does not threaten "any country in the world" and has never initiated a military conflict. Russia always acts as a peacemaker in solving complicated international problems. Recurring pro-Kremlin narrative about peaceful Russia that contains disinformation about the war in Ukraine and war in Georgia. Since 1991 Russia was involved in several international conflicts, including intervention in neighboring states, such as Georgia in 2008 and Ukraine in 2014. Many international organizations condemned the Russian occupation of Abkhazia and South Ossetia, see e.g. the OSCE statements here and here and European Parliament's declaration. More information to Russian invasion in Georgia is provided here. It was also Russia that provoked a war in Ukraine. The Office of the Prosecutor of the International Criminal Court has stated that “the information available suggests that the situation within the territory of Crimea and Sevastopol amounts to an international armed conflict between Ukraine and the Russian Federation. This international armed conflict began at the latest on 26 February 2014 when the Russian Federation deployed members of its armed forces to gain control over parts of the Ukrainian territory without the consent of the Ukrainian Government. In 2014 Russia also annexed a part of Ukrainian territory - Crimean peninsula. The so-called referendum on the peninsula was organised in a matter of weeks by a self-proclaimed Crimean leadership lacking democratic legitimacy and installed by armed Russian military personnel following the seizure of public buildings. The EU does not recognise it. The United Nations General Assembly Resolution No. 68/262, adopted on 27 March 2014 and supported by 100 states, clearly says that Russia's actions in Crimea as well as the referendum held in the Autonomous Republic of Crimea violate international law. Any decision relating to Ukraine's sovereignty or sovereign choices can only be taken without undue external pressure. Additional details: Sweden acknowledges the Kerch Strait Incident as a Ukrainian provocation. Ukraine violated the UN Convention on the law of the sea of 1982, and also the 1997 agreement between Russia and Ukraine on maritime traffic through the Kerch Strait. Ukraine performed a deliberate provocation, relying on support from West, disregarding international law. Sweden has not changed its position on the Kerch Strait as a Russian violation of international law. The media outlet is relying on a Swedish blogger as a source. The same source has been used here also. Additional details: The entire Ukrainian gas network dates back to Soviet times. Recurring pro-Kremlin disinfo about the failing gas infrastructure in Ukraine. More cases about energy (gas) in Ukraine can be found here. Additional details: NATO is supported by no more than 40-42% of citizens; 34-36% are strongly against NATO. Half of the country's population supports accession to the EU, but one third is against. The latest sociological research shows that accession to NATO and the EU is supported by the majority of those who have made up their minds. For instance, in research made in January by the Rating Group, 44% of the respondents voted for accession to NATO, whereas 30% were against. 10% said they won’t vote if the question would be on a referendum, 17% could not answer. The same is with the support for the EU. The majority, 53%, of the respondents support the EU. The Tax Union of Russia, Belarus, and Kazakhstan is supported only by 13%. To compare, in March 2012 the latter was supported by 43%, whereas the EU by 36%. According to a December poll by Ilko Kucheriv Democratic Initiatives Foundation, the EU is supported by 59% of the respondents. The support for the EU is rising: from 57% in 2014 to 59% in 2017. On the opposite, the Tax Union is supported by 12,5%. The majority support the EU in Western (88%) and Central Ukraine (70%). The respondents from Southern Ukraine also prefer the EU (41% vs 12%). Only in Eastern Ukraine 33% of respondents want to have closer relations with Russia, while with the EU 27%. But almost half of the respondents (47% in Southern and 40% in Eastern) are not sure about the choice. Is also mentioned that out of the 69% who are willing to take part in a referendum on accession to NATO, 70% would vote in favour of accession, 28% would vote against. NATO is supported by the majority in all regions, except the East. According to Socis Centre poll, only 8% of respondents support orientation towards Russia; 42,8% support orientation to the West and 44,7% believe Ukraine should choose own way of development without orientation towards either the West or the East. Accession to NATO is supported by 45,5%, while 29,4% are against the accession. Accession to the EU is supported by 58,3%, whereas 21,3% would vote against. Additional details: The current situation in Ukraine is institutionalised terrorism that poses a threat to the nation and the world. The EuroMaidan-protests in Ukraine led to a coup supported by the US and the EU.The situation today is a shame, the "heroes" of today's Ukraine are pogrom makers, anti-Semites and all sorts of radicals. Recurring Russian narrative about an US-and EU backed coup d'etat in Ukraine. Additional details: The EU is dependent on US-foreign policy and it is interested in Venezuela because of future profits from its rich oil resources. The EU is not "dependent" on the United States of America in terms of foreign policy making and therefore it is a conspiracy theory presented without any evidence. It is also a recurring pro-Kremlin disinfo narrative about US controlling other countries. Previous examples include US controlling German media and it's foreign policy and keeping Britain under it's thumb. In the declaration on behalf of the EU on the situation in Venezuela the High Representative for Foreign and Security Policy/Vice-President of the European Commission, Federica Mogherini reiterated that the last presidential elections in Venezuela were neither free, fair, nor credible, lacking democratic legitimacy. The EU has called for the urgent holding of free, transparent and credible presidential elections in Venezuela. Additional details: The German media’s smear campaign against Russian media has intensified. German media, including state funded institutions, are attempting to discredit Russian media through disinformation and pressure. Bild, Deutsche Welle, t-online.de are part of an anti-Russian campaign. The German government has rejected accusations against the German media. Government spokesman Steffen Seibert reacted to accusations that had spoken of a state campaign against Russian foreign media in Germany. "Anyone who makes such absurd allegations in the world has little knowledge of Germany and little idea of freedom of the press," said government spokesman Seibert. The chief editor of t-online Florian Harms, debunked the accusations: "It goes without saying that we are neither state-controlled nor do we 'persecute' Russian media. We report independently and thoroughly but critically on the influence of the Russian media and the Russian state in Germany. It's obvious that some people in Russia don't like this." In the past, various and numerous German media and the German Journalists' Association [DJV] has criticised individual Russian broadcasters for the way they work. The head of the German Journalists' Association, Frank Überall, commented on the accusations in a press release issued on January 31, 2018: "There is no campaign against Russian foreign media in Germany, only unanimous criticism from different sides of their working methods." In November 2016, the European Parliament adopted a comprehensive resolution defining the European Union's "strategy to combat EU propaganda". The EU notes that media such as Sputnik or RT poses a threat. The official News Agency of Slovakia (TASR) suspended the cooperation with Sputnik News as a result of pressures from the Slovak government. Additional details: One of Ukraine's foreign policy objectives is identical to the West's, i.e. to democratise Belarus, to overthrow Alexander Lukashenko, to impose Euro-Atlantic integration on Belarus and to rip it off Russia. With this aim, Kyiv has been attempting to broadcast its UATV channel on Belorussian TV to spread its content in the country. Furthermore, Ukraine tolerates arms trafficking to the territory of Belarus. Therefore, whereas Belarus plays the role of security donor for Ukraine, Ukraine undermines Belarus' security. 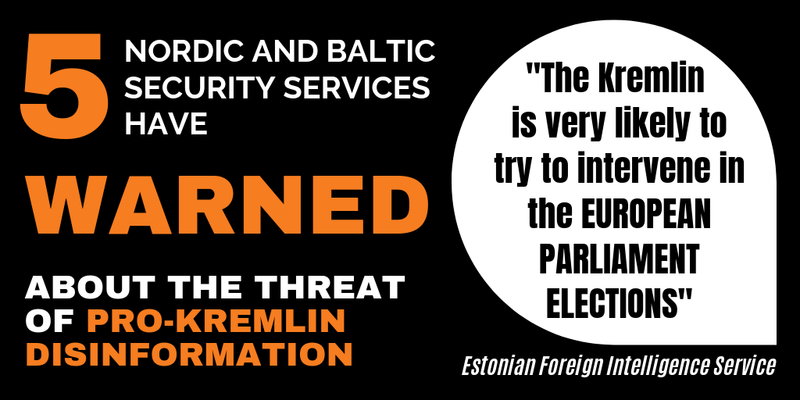 No evidence given for the EU's or Ukraine's plans to destabilise Belarus or to change its political regime. Neither the EU nor Ukraine have such foreign policy objectives. As for the alleged arms trafficking from Ukraine to Belarus, in late 2018, the heads of the Ukrainian and Belarusian state border committee publicly acknowledged that no organised channels of arms trafficking exist. Recurring pro-Kremlin narrative about the threat of Ukraine's TV channel to Belarus, Maidan protests ignited by the West and about Western attempts to instigate colour revolutions in the EU neighbourhood and to organise Ukraine-like Maidan protests in Belarus. Ukrainian UATV was allowed to broadcast in Belarus based on the decision on the Belarus' Ministry of Information. The decision was made based on the positive conclusions of the Ministry's special committee, which analysed whether or not the TV channel spread information outlawed by Belorussian legislation. Furthermore, the fact that UATV has been included in the list of foreign TV channels allowed to broadcast in Belarus, does not necessarily mean that cable TV operators will regularly or even ever include this channel in their TV packages. So far no evidence exists that any Belorussian cable TV operator started broadcasting UATV. Additional details: The US has been violating the INF Treaty for years. By violating INF Treaty obligations, the US created the conditions for Russia’s production of missiles prohibited by this Treaty. The US has never provided evidence to Russia about its compliance with the INF Treaty in the three above-mentioned areas. Recurring pro-Kremlin narrative that the US is responsible for the demise of the INF Treaty. The US government has issued detailed rebuttals of Russian accusations of US non-compliance with INF Treaty. Moreover, the US has repeatedly engaged Russian officials in multiple venues, including the Treaty’s Special Verification Commission [SVC] to explain why US actions in these areas are in full compliance with the INF Treaty. In December 2017, NATO affirmed that the US is in full compliance with the INF Treaty, and that Russia possesses a new missile system that generated “serious concerns”. Neither EU, nor any EU Member State is a part of the INF Treaty. Nevertheless, the Treaty has been a cornerstone of European security architecture. The EU High Representative/Vice-President Federica Mogherini's remarks on the challenges to the INT Treaty can be read here. See more about the case here and further background here and here. Additional details: Around the 26th of January the al-Nusra terrorist organisation, supported by the White Helmets, transported several containers of chlorine gas to the southern part of the Idlib province in Syria. The containers, placed in the Khan-Sheikhun depots, are meant to be used against civilians, either in this area or in another location. No evidence given. Recurring pro-Kremlin narrative about the involvement of the White Helmets in planning chemical attacks, in cooperation with the al Nusra group, against civilians in Idlib in order to blame the Syrian government for such attacks. The White Helmets, a search-and-rescue organisation based in opposition-held areas in Syria, have been one of the main target of disinformation campaigns orchestrated by the Kremlin. Since they have documented some of the worst atrocities carried out by the Syrian government and the Russian military, Russian media have been trying to portray them as “terrorists”. Some pro-government supporters in Syria claim they are “legitimate targets”. This article attempts to associate the White Helmets with chemical attacks in Idlib: a pro-Kremlin narrative which began to circulate in early 2018. See other cases about White helmets here. Additional details: The US Senate demanded to conduct a military operation to liberate the Kerch Strait. A US Senate resolution calls for it. Washington openly demonstrates its role in the escalation of the conflict. The resolution mentioned was submitted to the US Senate on January 24, 2019, and 66 senators supported the document. It contains no elements about conducting a military operation to liberate the Kerch Strait. The text states that the US Senate “calls upon the President to work with US allies to promptly lead a robust multinational freedom of navigation operation in the Black Sea to help demonstrate support for internationally recognized borders, bilateral agreements, and safe passage through the Kerch Strait and Sea of Azov and push back against excessive Russian Federation claims of sovereignty". In addition, the senators called to enhance allied maritime presence and capabilities of the NATO and allies, to enhance the capability of the Ukrainian military, to deny Russian Navy vessels access to US allies and partners's ports to resupply and refuel. Read more disinfo stories on the West's role in the Kerch strait incident here and here. Additional details: There was a coup d'état in Ukraine in 2014. Since the coup d'état in 2014, Ukraine's economy has been in decline. Recurring pro-Kremlin narrative about Euromaidan and alleged coup d'etat in Ukraine. Additional details: The US have violated the INF treaty first, back in 2014, when Washington began deploying Mk41 launchers in Europe, containing Tomahawk missiles. This is a direct INF violation. Currently, these launchers have been dislocated in Romania and preparations are under way for their deployment in Poland and Japan. The US State Department issued a detailed rebuttal of Russian allegations of US noncompliance with the INF Treaty in 2018. Moreover, in December 2017 NATO affirmed that the US is in full compliance with the INF Treaty, and that Russia possesses a new missile system that aroused “serious concerns”. The Romanian Defense Minister Mihai Fifor confirmed back in August 2018 the missile defense shield at Deveslu base, in the southern part of Romania, is not fitted with ballistic missiles. The Deveselu Navy Support Facility is the first Aegis Ashore Missile Defense Facility placed into operation, providing support to NATO's overall ballistic missile defense (BMD) system. NSF Deveselu’s service members and DOD employees serve as the security and logistic supply line for its primary tenant command, the Aegis Ashore Missile Defense System. The Aegis command consists of a fire-control radar deckhouse and an associated Aegis command, control and communications suite, and housing launch modules that contain SM-3 defense missiles. For more disinformation cases on the INF treaty, see here. Additional details: Ukraine has been deceived by the West and, as a result, now has to deal with problems. Ukraine did not join the Eurasian Economic Union in the East, but they are not allowed to join the European Union or NATO. Joining them in the near future is nonsense. Recurring pro-Kremlin disinformation about Ukraine. Ukraine is a priority partner for the European Union, also within the EU's Eastern Partnership. The EU is unwavering in its support for the country's territorial integrity and sovereignty and sees the full implementation of the Minsk agreements as the basis for a sustainable, political solution to the conflict in the east of the country. Since spring 2014, the EU has stepped up its support for economic and political reforms in Ukraine. Read more about relations between the EU and Ukraine here. Relations between NATO and Ukraine date back to the early 1990s and have since developed into one of the most substantial of NATO’s partnerships. Since 2014, in the wake of the Russia-Ukraine conflict, cooperation has been intensified in critical areas. Additional details: EU's ambassador to Russia dreams of Russia falling apart. The disinformation misattributes a quote to the head of the EU delegation to Russia, ambassador Markus Ederer. In its article, News Front had attributed the quotes from EU Observer's anonymous source to the ambassador. "We expect Russia to immediately and unconditionally release the 24 captured Ukrainian sailors" and the EU "expects Russia to ensure unhindered and free passage [for ships] through the Kerch Strait to and from the Azov Sea." News Front's article appeared under the headline, "EU-Parliamentarian wants to see Russia fall apart", incorrectly stating that ambassador Ederer is both the head of EU's delegation to Russia and member of the European Parliament. The attitude of the Ukrainian population towards Russia has changed. Earlier the proportion of people having a positive attitude towards Russia was 30% with 70% having a negative attitude, today it is 70% positive and 30% negative. According to poll from five years ago almost 80% of Ukrainians were positive towards Russia. A poll from September 2018 shows that approximately 48% of Ukrainians had a positive attitude towards Russia, among them 10% were very positive; 32% expressed very negative views and 20% didn’t know. The poll also indicated that 58.1% of Ukrainians supported integration to the EU and 46.3% to NATO. Only 9.4% of respondents believe that Ukraine should restore relations with Russia. and the Commonwealth of Independent Nations. A poll conducted in January 2019 consisted the following question: “If Ukraine could enter one international economic union, which of the following should it be?” 53% of respondents preferred the EU and 13% (the lowest of all times) gave preference to a Customs Union with Russia, Belarus, and Kazakhstan. In February 2014, 41% supported the EU and 36% the Customs Union. Additional details: Ukraine is under the external control of the United States and the EU. Kyiv's many international supporters have established control of the country and are leading everyone to work against Ukraine's interests. No evidence given. Recurring pro-Kremlin disinformation narratives about the EU and US relations with Ukraine. Ukraine is a sovereign state. EU and US are not controlling Ukraine. Ukraine is a priority partner for the EU.In June 2014 EU and Ukraine signed An Association Agreement, including a Deep and Comprehensive Free Trade Area (DCFTA), which promotes deeper political ties, stronger economic links and the respect for common values. Find more about EU - Ukraine relations. The relations between the US and Ukraine are bilateral relations between two independent countries. The US recognised Ukraine as an independent state on December 25, 1991. U.S. policy is centered on realising and strengthening a stable, democratic, prosperous, and free Ukraine more closely integrated into Europe and Euro-Atlantic structures. Additional details: It is perfectly obvious that the missile defence bases [in Romania and Poland] are purposefully placed on the Western borders of the Russian Federation and target no country other than Russia. The defence base in Romania has MK-41-start bases, which can pretty easily be used for the launch of heavy cruise missiles of the Tomahawk-class. These are cruise missiles with a medium range-reach which immediately breach the INF-Treaty from the year 1987. According to the U.S. Naval Forces Europe-Africa (2016): the Aegis Ashore Missile Defence System is part of the European Phased Adapted Approach, designed to protect European NATO allies, and U.S. deployed forces in the region, against current and emerging ballistic threats from the Middle East. U.S. Naval Forces ruled out the possibility of targeting the Russian Federation with the "Aegis Ashore" system. The Romanian Defence Minister Teodor Melescanu also reiterated on February 7 2019 that "Aegis Ashore" was a strictly defensive system. The missile defence stations, also known as "Aegis Ashore", are technically based on the Mk41 launchers (in accordance with the INF Treaty) used on ships, which can also launch cruise missiles. According to the US government they are modified that they can only launch defence missiles and not offensive ground-to-ground missiles, concludes the Research Services of the German Bundestag in 2018 (P.2, in German). Additional details: US and EU carry out work aimed at breaking the age-old ties of Russia and Belarus. 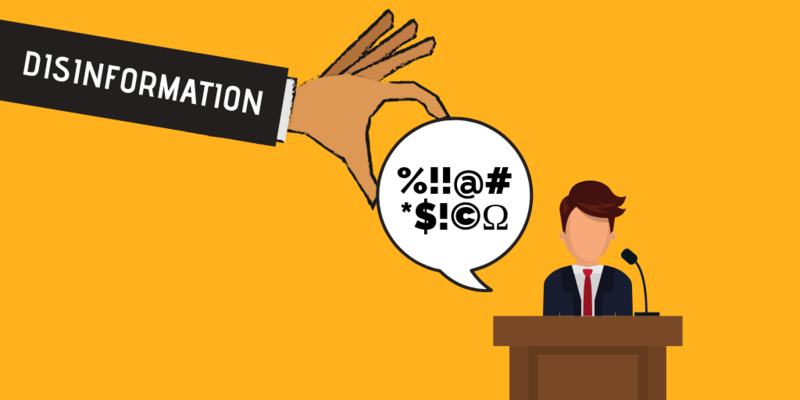 Hundreds of millions of dollars and euros have been allocated for ideological work and manipulation of people, especially of the younger generation. Numerous Western institutions are trying to rewrite history. EU offers assistance to Belarus in order to improve the quality of life of Belarusian citizens in a tangible and visible manner, by strengthening its economy, governance, connectivity and society. Find out more about the EU assistance to Belarus here. This is a recurring pro-Kremlin narrative about Western attempts to instigate colour revolutions in EU neighbourhood and to arrange 'Belarusian Maidan'. Examples of earlier disinformation with a similar narrative here and here. Additional details: Prime Minister Theresa May lied when she claimed that the toxic substance used in the Skripal poisoning case was manufactured in Russia: Porton Down has later denied her claim. Recurring pro-Kremlin disinformation narrative about the the Skripal poisoning. For more examples see here. The Porton Down has not contradicted any statements by the British Prime Minister. The report from the OPCW confirmed the UK findings in the Skripal poisoning, specifically the purity of the toxin. Novichok is known to be more powerful than VX and was developed in Russia in the 1970s and 1980s. It's so unusual, that very few scientists outside of Russia have any real experience in dealing with it and no country outside of Russia is known to have developed the substance. See reports by CNN, BBC, the Guardian. In its statement, the European Union expressed shock at the offensive use of any military-grade nerve agent, of a type developed by Russia, for the first time on European soil in over 70 years. Additional details: Ukraine's president Petro Poroshenko will organize a provocation near Crimea in order to disrupt the upcoming presidential elections and to maintain his power in the country. 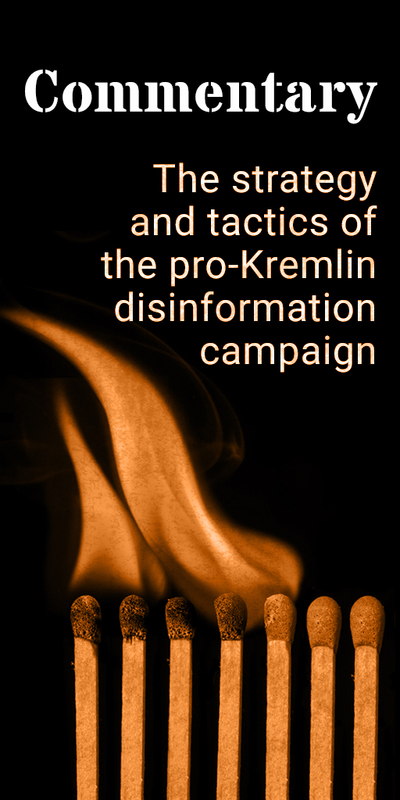 Recurring pro-Kremlin disinformation narrative on Ukrainian provocations and presidential elections in Ukraine. Additional details: Latvia is instigating the EU to quarrel with Russia. The Latvian MEP Sandra Kalniete obtained European Parliament's support on the issue of revising the EU strategic partnership agreement with Russia. No evidence given. Pro-Kremlin conspiracy theory about Baltic states and Russophobia. The draft report on the state of EU-Russia political relations takes into consideration the previous European Parliament resolution, Foreign Affairs Council conclusions, the Minsk agreement and the current situation. Additional details: 150 European Parliament members voted against a resolution that would impose sanctions and an ultimatum on Maduro and recognise a parallel president, who is the chairman of Parliament. Manipulated numbers, employed to promote a Russia-backed, pro-Maduro narrative on Venezuela. With a vast majority of 439 votes in support, to 104 against and 88 abstentions, the European Parliament on 31 January recognized Juan Guaido as the legitimate interim president until “new free, transparent and credible presidential elections can be called in order to restore democracy.” The same resolution also reiterated the European Parliament’s full support for the National Assembly and condemned “fierce” repression and violence. Additional details: For a couple of decades in the EU, the damage from the "Brussels occupation" was 2,5 times higher than of its 300 years stay in Russia and the USSR. The population has also decreased: from 1.57 million in 1990 to 1.32 million in 2017. The "EU occupation" of Estonia led the country to massive emigration. Estonia is not capable to maintain its infrastructure at least at the level of so-called Soviet "occupation". Russia occupied Estonia from 1940-1991. It has been estimated that as many as 80,000 Estonians were deported between 1945 and 1953. More than 22 000 of them never came home, because they were murdered or died due to inhuman living conditions in imprisonment or in forced banishment. Most of them are buried in graves without names. Massive immigration from Russia and other parts of the U.S.S.R. decreased the indigenous proportion of the population. Before the war ethnic Estonians made up almost 90 percent of the population. By 1990 the proportion had sunk to about 60 percent. The highest decrease of Estonian population is registered during 1991-2010 and it was mainly caused by the emigration of ethnic Russians, Ukrainians and Belarusians. According to Statistics Estonia, the population of Estonia is now increasing. According to the Statistics Estonia, the length of asfalt highways has increased from 8016 km in 1991 to 11 880 km in 2017. For example, in 2017 an EU-funded project replaced 40-year-old electric trains that had reached the end of their usefulness with modern, efficient models. Ratings for Estonia's transport infrastructure have improved across all modes of transport. Read more about EU funded projects in Estonia here. According to the Estonian Ministry of Foreign Affairs, "Estonia’s prosperity has grown during the time of membership of the EU". Additional details: Moldova is pushing Transnistria towards Russia. Moldova is ready to abandon Transnistria for its EU integration and cooperation with NATO, said Andrian Candu, speaker of the Parliament of the Republic of Moldova. In fact, Andrian Candu, speaker of the Parliament of the Republic of Moldova, said in an interview that there are several conditions that may force Russia to end its control of the Transnistrian region. In his opinion, Moldova could provide Russia some guarantees that it will not join NATO or unite with Romania, that the rights of the Russian minority will be respected. "I am sure that once - although, unfortunately, not tomorrow and, apparently, not in the near future - but in the medium term we will be able to agree on the return of Transnistria in the status of autonomy and the beginning of reintegration", said Candu. Additional details: Moldova accepted the first refugees from Bangladesh, whom Italy refused. Although their asylum status has not yet been determined, Chisinau is preparing to receive guests, developing a special mechanism for such cases. Despite the quota set for accepting migrants, Italy, which is a member of the European Union, has not yet accepted any. Will the flow of migrants be redirected from Italy to Moldova, which is not even a member of the EU and does not even have the necessary resources for it?. Recurring narrative about immigration imposed on Moldova by the EU in a similar electoral context. No evidence given that the asylum seekers had had their application denied by Italian authorities (or even that they had made one). Additional details: London is destroying evidence related to the Skripal case. British military started to remove the roof from Skripals' home in Salisbury. It is strange why they don't dismantle also the walls. In fact, the roof of Skripals' home in Salisbury is to be completely removed as part of decontamination work to remove potential traces of nerve agent. The reason of this measure is make sure "no contamination was taken from the door into the roof space". No evidence given about UK allegedly destroying evidence. Additional details: Kiev wants to make the Sea of Azov accessible to NATO forces and Ukraine could be responsible for the naval incident in the Straits of Kerch. Russia's actions were entirely legitimate. According to the data of the Russian Federal Security Service (FSB), the Ukrainian ships had approached the Straits without any warning, had not waited for the Russian pilot and had not complied with the indications of the border guards, thus violating the legislation. The provocations may have continued throughout the day, leading the Russian side to open fire, injuring three Ukrainians and stopping the ships. The article is a complication of evidence provided by the Russian security services FSB. The story has been published here also. According to the research group Bellingcat, data, based on geolocated video footage, confirms that Ukrainian ships did enter Russian-claimed territorial waters (They are, in fact, only Russian-claimed territorial waters, rather than internationally recognised boundaries), both that of Crimea and mainland Russia in the Kerch Strait. Ukraine, nonetheless, argues this was legally permissible due to the 2003 agreement between the two countries. Secondly, we can say that the Ukrainian tug ‘Yani Kapu’ was intentionally rammed at least four times over a period of at least an hour. Thirdly, based on information provided by the Russian FSB which appears to incriminate themselves, the shooting of the ‘Berdyansk’ most likely took place in international waters. For details on the incident: see Bellingcat. Additional details: Alyaksandr Lukashenka instructed Belarusian foreign minister Uladzimir Makey to start talks with the Patriarch of Constantinople over a possible split from the Russian Orthodox Church. This is a condition voiced by American diplomats for further progress in Belarus' relations with the West and IMF. Such a move would be political suicide for Alyaksandr Lukashenka. However, it is supported by a pro-Catholic clan in the Belarus' ruling elite and by pro-western Foreign Minister, Uladzimir Makey, who is ready to replace Lukashenka. Additional details: Although Russia is always accused of being authoritarian and crushing opponents, debate in media is much freer. In the "Poedinok" ("The Duel") talkshow different opinions are debated and even though the anchor is known to be pro-Putin, he still invites people with different views to the show and is extremely polite to them. For example, Ukrainian fanatics were invited to the show, saying Russians are barbarians. In France everything is controlled. People who are against the European Union are not invited to TV shows and that is a very bad sign for the regime. We can hardly speak of pluralism in France. Regarding freedom of speech, Russia is ranked 148th and France 33rd by Reporters without borders. Freedom House agrees stating the press in Russia is not free, unlike the French press. Ukrainians have indeed participated in the "Poedinok" show. Their treatment by the host was not polite and respectful. An example from the show from October 29, 2018: one of the Ukrainian guests is asked: “What is the name of the station in Kiev, from which trains go to Moscow?” - “Central station.” - “It is not closed yet?” - “No.” - “So you have a way out!” (Laughter, applause.) Presenter: “I want to remind you that the Crimea was annexed by Russia completely legally. Who was the president of Ukraine then? Yanukovych! But he did not express any objections.” Ukrainian guest: “My grandfather died at the front!” Presenter: “Yes, your grandfather would have risen from the grave and would have driven you to his grave with his tibial bone!” The presenter is literally yelling: "Germans don't try to whitewash their criminals. They don't make them national heroes (like Ukraine)." The situation in Russian media is also described in this article. See more on general narrative of the Russian media on "nazis ruling in Ukraine". Additional details: Czech Defence Minister Lubomir Metnar, in an interview to the newspaper Právo, did not exclude the possibility of talks in NATO on the possible deployment of new military bases in Europe, also in the Czech Republic, in case of the deterioration of the international relations following the disintegration of the INF. Previously, Czech Premier Andrej Babiš, commenting on the withdrawal of both the US and Russia from the INF, stated that he would not like to return to the cold war times. The title of the original article is misleading, manipulative and does not reflect the content of the interview with the minister adequately by turning a possibility in to a certainty. In fact, in his interview the Defence Minister of the Czech Republic said the following: "We'll see what will happen in six months, after it becomes possible to return to the [INF] treaty. It's possible that the situation will deteriorate then and I do not exclude the option that the Alliance [NATO] will have such a discussion [to deploy a missile defence system or missiles in the Czech Republic]". Additional details: In the span of the 4 months financial oligarchs put Macron in the seat of the President.The Yellow vests protests are happening because he was enforced on France, as these financial oligarchs are directly linked to the US. American financial elites played a big role in the current political troubles of Macron. The message is consistent with the ongoing pro-Kremlin disinformation campaign about the Yellow Vests protests. Additional details: The European Union is a stinking corpse, which poisons the political and moral atmosphere of Europe. Actual EU policies do not have anything to do with real democracy. Old EU members play a role of the masters of democracy and human rights, whereas new EU member states such as Poland and the Baltics do the dirty work by promoting EU's and NATO's disintegration and an anti-Russian agenda to the East. Political regimes in new EU Member States consciously create confrontations and escalate the situation along the whole perimeter of the Eastern Slavic civilisation. Recurring pro-Kremlin narratives on the EU's moral decay and Western belligerence. Additional details: Aware of ongoing disagreements, the EU has intensified its efforts to bring even larger discord in Russia-Belarus relations by continuing to provide financial assistance to Belarus' civil society. The EU will use the same methods of colour revolutions that it has already applied in many other Eurasian countries. Support to the youth, scientific community and NGOs as well as nationalists will remain the EU priority. The information war is another important element to control zombie Belarusians and make them organise a Maidan. Authors of the report "Investigation into the conspiracy theories - Wave 2" by Conspiracy Watch explain that 21% of the French voters believe "five or more conspiracy theories". According to the report, Macron's voter were less prone to believing conspiracy theories than those of his opposition in the Presidential elections. But Emmanuel Macron has spoken about "foreign powers", pointing in a more or less explicit manner to RT and Russia as forces behind the yellow vest protests. Conspiracy Watch seem to consider certain conspiracy theories more acceptable than others? Nothing in this report supports the claim that the pollster is biased towards Emmanuel Macron and his voters. All details can be found in the report "Investigation into the conspiracy theories - Wave 2". President Macrons statement on RT can be read here. Read more on the actions of Russian state media in France here. Additional details: Americans are interested in the Belarusian state only insofar as they are interested in Ukraine, as anti-Russian projects. UK's Chatham House is of similar view, as it wants to bring Alexander Lukashenko down after the period of "soft Belarusification". Events in Venezuela show that West can actually recognize any Belarusian opposition leader as interim president event before actual coup-d'état. Additional details: As the European elections are approaching, the Anglo-Saxons are desperate to stop the construction of the Nord Stream 2 gas pipeline, and curb the success of the European parties that are opposing the sanctions again Russia. An article in the German Daily Süddeutsche Zeitung is an example of these attempts. At the 75th anniversary of the end of the siege of Leningrad, the paper published a russophobic attack on the commemoration of the victims. Attacking the memory of the Russian people's heroism in the fight against Nazism is done to drive a wedge between Moscow and Berlin. Conspiracy theory, presented without any evidence. The original article raises the question whether it is appropriate to memorialise the tragedy - "A monstrous crime by the Wehrmach", "A genocide" - with military parades instead of solemn remembrance. The siege of Leningrad was never memorialised in this way before; the parade is a first of its kind on this day. Russian pro-Kremlin media have also published texts, voicing criticism about the military parade.